President Trump’s administration appears little troubled by the sharp democratic decline in Southeast Asia—but it should be, for economic and security reasons. CFR scholars provide expert analysis and commentary on international issues. Southeast Asia’s democratic regression has taken a dramatic turn for the worse in the past few years. In Thailand, the military junta, which seized power in 2014 from an elected government, this year oversaw the trial of ousted Prime Minister Yingluck Shinawatra. In Myanmar, the military has reportedly rampaged through western Rakhine State against ethnic Rohingya, creating the biggest humanitarian crisis in East Asia, with the tacit support of Aung San Suu Kyi, now the de facto leader of government. In Cambodia, Prime Minister Hun Sen and the ruling party have driven half of the parliament’s opposition members out of the country. Even the region’s freest nations, like the Philippines and Indonesia, face significant threats to their democracies. The region’s seemingly successful democratization in the 1990s and 2000s was seen as a model for other developing nations, but now its democratic collapse reflects trends sweeping the globe. Public opinion seems to be shifting, too. New data from the Pew Research Center shows significant numbers of people, in thirty-eight surveyed countries, are willing to consider alternative models of governance to democracy. The Trump administration’s America First policies, which will be on display during the president’s upcoming trip to Asia, have only emboldened autocrats in Southeast Asia—and in other parts of the world. Yet the White House’s disinterest in supporting democracy is a mistake. In the long term, democratic backsliding will imperil freedoms for people suffering under increasingly autocratic rule. But it could also impair regional and global security; as mature democracies tend to work most effectively with the United States. Those countries operating under the whim of a strongman are less reliable partners. The political crackdown in Southeast Asia is likely to get worse in the coming year. Cambodia, Malaysia, and Thailand are all slated to hold elections in 2018, though none of these may be free or fair. Last year, Thai generals oversaw the passage of a new constitution that weakens the biggest elected parties in the lower house of parliament and empowers the unelected upper house and other unelected institutions. In Cambodia, the government has incapacitated the top two opposition leaders: one is in exile in France and the other in jail. Malaysian Prime Minister Najib Razak has increased the arrests of political opponents, according to many rights organizations. This current generation of Southeast Asian leaders shows minimal interest in democracy other than at the ballot box. There are numerous reasons why Southeast Asia’s democratic regression has worsened of late. While the region has sustained solid economic growth since the early 2000s, many countries suffer from high levels of inequality, the influence of industrial monopolies, and widespread graft. Savvy politicians, from Philippine President Rodrigo Duterte to Thailand’s Shinawatras (Yingluck and her brother Thaksin before her), have played on anti-elite sentiment to win elections; Thailand’s military junta has also sought to tap into populist sentiments. The current generation of Southeast Asian leaders shows minimal interest in democracy other than at the ballot box. These autocrats emphasize electoral aspects of democracy; once elected, they often destroy other fundamental components, like the rule of law and constitutional norms. In addition, Southeast Asian leaders encourage lower-income and middle-class people increasingly struggling with fast-paced technological, economic, and social change to blame these challenges on “others,” including religious minorities in Indonesia, drug users in the Philippines, people from regions outside Bangkok in Thailand, and ethnic and religious minorities in Malaysia. In the region, middle classes also have grown increasingly willing to support alternatives to democratic governing. For instance, middle-class Bangkok residents rallied in the streets for months in 2013 and 2014, with many essentially calling for a coup. Similarly, the 2014 Indonesian presidential candidate—and likely 2019 candidate—Prabowo Subianto drew strong support from middle classes despite his signaling he would roll back Indonesian democracy. In fact, these elected autocrats are popular, and popularity provides their leadership with greater legitimacy. Duterte’s popularity ratings stand over 70 percent more than one year into his term—and his drug war. In Malaysia, too, opposition to Najib’s increasingly autocratic rule has faded and been divided. Suu Kyi appears to retain high popularity among the Myanmar population despite the ongoing atrocities in Rakhine State. Southeast Asia’s democratic regression resembles patterns that have emerged globally. Freedom House has recorded global reductions in freedom for the past eleven years, using various criteria to measure civil liberties and political rights in each nation. (Author’s note: I contributed to several chapters on Southeast Asia in Freedom House’s Freedom in the World 2017.) In the past two to three years, democracy has gone from at risk in many places to outright decimated. In countries from Zambia to Venezuela to Turkey, rulers have cracked down much harder by jailing journalists and academics, and simply tossing foreign NGOs out of the country. In many of these states, free media and an independent judiciary are now dead. The actions of leaders, like Turkey’s Recep Tayyip Erdogan, Venezuela’s Nicolas Maduro, or Egypt’s Abdel Fatah al-Sisi, are completely unconstrained. The Philippines has been considered a consolidated democracy, but Duterte has badly undermined many institutions. With his far-reaching drug war, he has fostered a climate of impunity, weakened the rule of law, effectively sanctioned extrajudicial killings, and chilled opposition to his rule. This democratic collapse coincides with a U.S. retreat from global leadership on rights. Strongmen looking to amass more power can also draw upon trends in public opinion that help them consolidate their control. As Pew polling indicates, people seem increasingly willing to believe democracy is not always the best way to run a country. Among younger generations, the basic exercise of voting seems increasingly uninteresting. Many wealthy democracies now have large numbers of potential voters who don’t participate, especially voters under twenty-five. In part, younger voters may be alienated from traditional political parties and more interested in promoting ideas through causes than electoral politics. They may also be souring on democracy itself: research by Yascha Mounk of Harvard University and Roberto Stefan Foa of the University of Melbourne suggests that millennials in wealthy democracies are increasingly tolerant of authoritarian alternatives to democracy. This democratic collapse coincides with a U.S. retreat from global leadership on rights. The absence of strong U.S. language endorsing democratic values and processes will be glaringly evident on Trump’s Asia trip in November. Although the Barack Obama administration failed to devote enough funds and rhetorical attention to democracy promotion, it at least maintained the idea that promoting democracy was a core component of U.S. foreign policy. The Trump administration has taken a different approach, notably in Southeast Asia. Overall, the president has articulated an America First foreign policy; his State Department wants to cut resources for programs on democracy promotion and possibly remove it as a central priority. The White House has placed sovereignty at the core of its foreign policy, jettisoning participation in many multilateral accords because it believes they do not place enough priority solely on U.S. interests. Southeast Asian authoritarians have also noted Trump’s war on the U.S. press as a model. 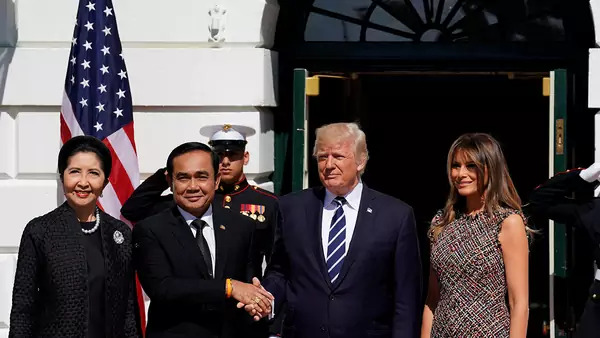 For example, Cambodia’s Hun Sen has aligned himself with the U.S. president in disdain for the press, claiming that both he and Trump see the media as “an anarchic group.” In the past year, Hun Sen has taken further steps by shuttering many independent media outlets. Even if autocratic-minded leaders do not mimic the White House’s approach to the media, they know that the current U.S. administration is not going to press them on rights and freedoms. In Asia, Trump also has worked to boost ties with authoritarian leaders, hosting Malaysia’s Najib (amid Najib’s alleged links to Department of Justice graft investigations) and Thai coup-maker and Prime Minister Prayuth Chan-ocha earlier this year. The White House has been largely quiet on the emergency in Rakhine State, although in recent weeks the administration has taken some modest steps against the Myanmar military, including pulling invitations to senior Myanmar military officers for U.S.-sponsored events. Trump’s Asia tour is designed to stress the administration’s focus on the region and its support for allies and partners like Japan, Vietnam, and South Korea—although Trump is skipping the East Asia Summit, one of the best places for U.S. leaders to demonstrate their commitment to the region. Meanwhile, Trump is set to meet with Duterte, signaling U.S. support for a man who was criticized by the Obama administration (and many other governments) for a drug war that has killed more than 6,500 people. Trump will also pay a visit to Vietnam, in conjunction with the Asia-Pacific Economic Cooperation meeting. The White House appears to be continuing to bolster close security ties with Hanoi, despite its rights record, which has regressed recently. This is a mistake. Although there is no guarantee that democracy comes hand in hand with economic growth, many studies have shown that electoral democracies are generally more effective at improving human development [PDF]—tracked by progress in areas like life expectancy and quality of life. Democracies are also more likely to be the best long-term partners for the United States. The United States works most effectively with countries on major strategic and economic challenges when they share similar, relatively open political cultures; its closest partners in Asia have historically been Japan and Australia, and its strongest alliance is the North Atlantic Treaty Organization (NATO). Autocratic or semi-democratic regimes tend to be more brittle, making them less valuable strategic partners. For instance, as Thailand has regressed from democracy, it has become increasingly unstable and a less effective regional leader and U.S. partner. Strongmen can be volatile and bombastic, and are unconstrained by other political institutions. Duterte held a warm phone call with Trump in April, but could easily turn against Washington if he perceived some slight on this trip or later. He already has used his immense power to drastically change Manila’s approach to the South China Sea, making the Philippines a less reliable U.S. partner in that area. Similarly, Thailand’s military rulers, Hun Sen, and even Najib are unconstrained, and can shift political positions almost at will, making relations with any outside power more precarious. This America First disinterest in rights, combined with skipping important summits, could well make Washington even less relevant to the region—a region becoming less stable as its freedoms lag.